Today I went to the 9th Ward, which is on the eastern edge of downtown and the French Quarter. 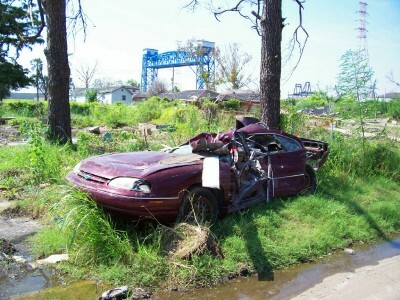 It was roughed up a whole bunch during the hurricane, and while I had already visited Lakefront (another storm-ravaged part of town) in December, I never actually went to see the 9th ward. Later on, I'll put up some more pictures on my site, but here was one that I took with my mom's camera. There were lots of overturned cars, and ruined houses still. We saw a bunch of construction crews there, and they seem to be taking away a bunch of refuse, but the rebuilding in that part of town is proceeding slowly. (This is just as far as I can tell, and not based on any other evidence.) Things are much better in other parts of town though.